Wodonga lies on the Victorian side of the Murray River, Albury directly opposite, on the New South Wales side. The only other major city in Australia to effectively straddle a state boundary is Coolangatta/Tweed Heads, on the New South Wales/Queensland border. The railway from Melbourne finally reached Wodonga in 1873, but for almost one hundred years, until 1962, passengers to Sydney had to change trains and railway gauges at Albury. A freeway bypass of Wodonga opened in 1985, but the Albury bypass did not happen until 2007. Wodonga has always been overshadowed by the more populous Albury, with its grand hotels and railway station. Both cities grew rapidly with post-war migration, a growth pattern confirmed with the selection of Albury Wodonga as a ‘growth centre’ by the federal, New South Wales and Victorian governments in 1973. The Bonegilla migrant camp, with its Migrant Experience interpretation centre, is 12 km due east of Wodonga. Wodonga is a provincial city in north-east Victoria. It was named after the Wodonga pastoral run, taken up by Paul Huon in 1836, although it was his brother Charles who became the district's advocate. Immediately north of Wodonga there are the Wodonga river flats, through which passes the flood-prone Murray River. At the point where the Wodonga Creek and the Sydney road intersected with the Murray River, a town was surveyed by the Victorian government surveyor in 1852. It was named Belvoir, after Charles Huon's homestead. The formation of other official townships along the Sydney road in the next few years marked the road as the main inter-colonial freight route, and Belvoir's position immediately before the river crossing made it a stopping-off place. During the 1860s Belvoir became known as Wodonga (thought to be an Aboriginal word meaning bulrushes), and a gazettal on 7 August 1874, confirmed the change of name. By 1865 Belvoir had a school (1857), a court of petty sessions, branches of insurance offices, two hotels, a flour mill, and a sawmill. The estimated population was 500 persons. 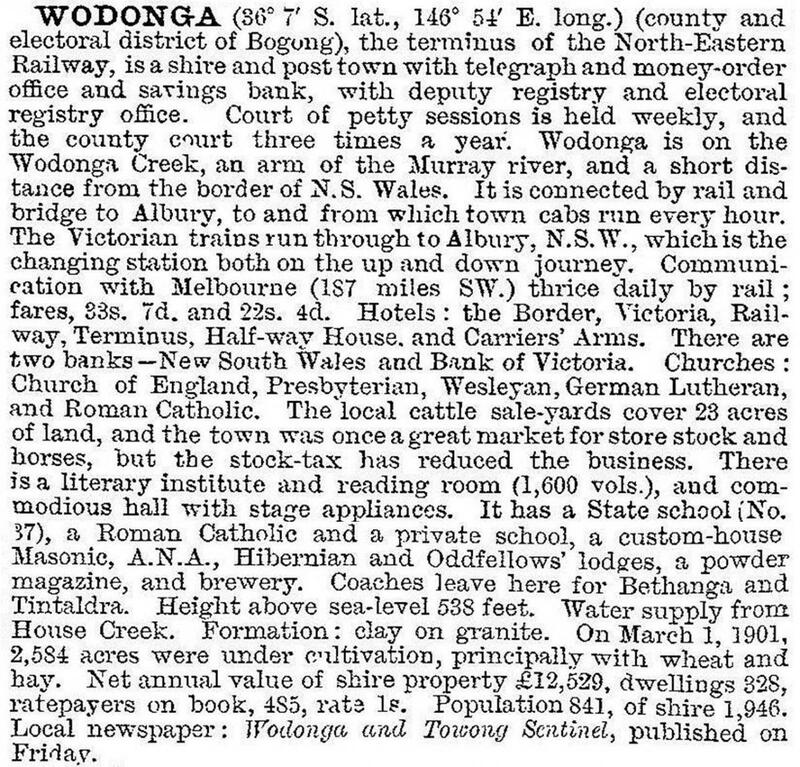 During the 1870s Wodonga's population increased rapidly: pastoral runs were opened for selection and the railway from Melbourne to Wodonga was opened in 1873. Wodonga shire was created on 10 March 1876, its area including Bandiana and Bonegilla to the south-east of Wodonga. Its area was 167 sq km. The first causeway across the Wodonga flats was formed in 1870, becoming the forerunner of the Lincoln Causeway on which the Hume Highway was built. In 1890 a branch railway line to Tallangatta, east of Wodonga, was opened. The animal saleyard at Wodonga had large throughputs of meat and dairy cattle and, when the Victorian border tax reduced sales, horses for the Indian Army were bred locally and sold through Wodonga. Dairying along the river flats was active and the Wodonga Butter Factory was amalgamated with others to become the North-Eastern Dairy Company. Further industries were opened in Wodonga, notably Uncle Ben's pet food and an export abattoir (1967). In 1973 the Commonwealth, New South Wales and Victorian Governments agreed to the Albury-Wodonga Development Scheme, for a decentralised growth area. Before then the Wodonga Development Committee and the Shire Council promoted the town’s industrialisation. Although the growth fell short of projections, Wodonga municipality's population doubled between 1971 and 1991 to 26,389. Wodonga was the minor partner to Albury, having 30% of Albury-Wodonga's office space (1986) and about the same proportion of retail floor space. During 1954-63 two primary schools, a high school and a technical school were opened. Wodonga West primary school was for children from Housing Commission estates and from married quarters at the Bandiana military camp. Since then two more primary schools, a Catholic secondary college, a Lutheran P-12 school, the Clyde Cameron Trade Union College and a La Trobe University Campus have been opened. Wodonga has a racecourse, recreation reserve and showgrounds near the Bandiana military camp, a large livestock saleyards (Bandiana), several parks along watercourses, sports ovals, a golf course, an indoor sports and leisure centre and a wide range of other community services. The original saleyards site in Elgin Street was sold for Wodonga Plaza shopping centre (1980, enlarged 1995). The town and residential area were bypassed in 1985 by an extension of the Hume Freeway, joined to the Lincoln Causeway. In addition to the usual Protestant and Catholic churches, there are Lutheran (1875), Serbian (1964) and Ukranian Catholic (1962) churches. By 1997 Wodonga had eleven hotels and motels, providing 668 bed spaces. Wodonga shire’s farm activity was grazing, with 100,000 cattle and 16,900 sheep and lambs in 1994. Wodonga shire became Wodonga Rural City on 30 March 1973. On 18 November 1994, it was united with parts of Chiltern and Yackandandah shires and renamed Wodonga city. The municipality’s area was increased from 347 sq km to 430 sq km, and the main population area that was added was the southern part of Baranduda. Federal legislation to wind up the Albury Wodonga Corporation (1973) was passed in 2014. Plans to revitalise Junction Place in the Wodonga CBD were made in 2014.